Free-to-play is the driving force in today's mobile and social games — we start playing them because there is no cost to do so. Whether or not we keep playing them may well depend on the 15 rules of free-to-play outlined by Gamesbrief's Nicholas Lovell earlier today at the F2P Summit in London. Edge's Nathan Brown wrote up a lovely summary of the talk, so I'll touch on a few of the points I found particularly interesting before scooting you over there for the full list. As my wife has worked at Starbucks for six years, I'm particularly ford of The Starbucks Test. 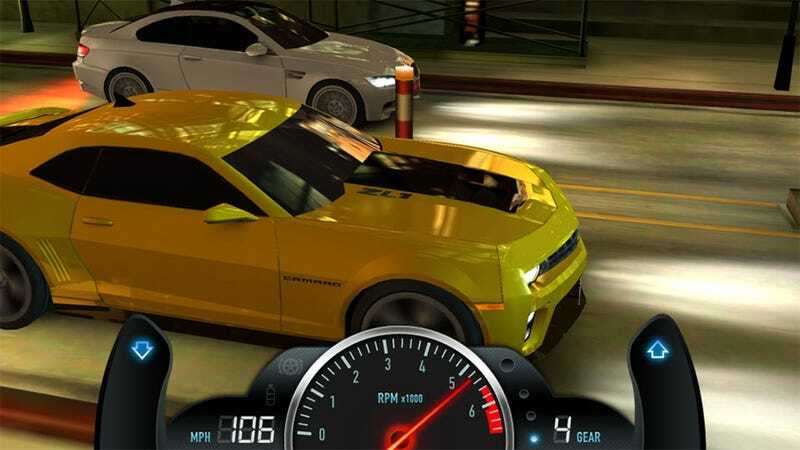 It's an idea borrowed from NaturalMotion CEO Torsten Reil (makers of the amazing CSR Racing, pictured above), who asked "Can you play a game and have a meaningful experience in the time it takes for a barista to make your macchiato?" The game doesn't have to be bite-sized and snackable, but the gameplay does. I can hop on to Happy Street, restock my shops, get some crafts going and collect lumber from the forest, and by the time I am done my wife still has not made me a macchiato. She's pretty terrible. "Be Generous" is also immensely important. "If you want people who spend money in your game to be better than other people," Lovell said, "there have to be other people in the game for them to be better than." You can't make it too easy for the paying players to trump the non-paying, so you have to make sure the cheapskates (go cheapskates!) have enough power to keep them competitive. It's a delicate balancing act that even the most popular games are constantly tweaking. And possibly the most important rule of them all: Be Free Forever. If I download a free game, advance to a certain point in the game and am asked to pay money to advanced, it is no longer a free game, and I am no longer playing. Hit up the Edge story below for all 15 of the free-to-play rules. For players it offers interesting insight into the mindset of F2P developers and how they work at opening your wallet. And for developers? These are brilliant. Follow them.